The clips lock the two board halves together more effectively than their Voile counterparts, and really transform the splitboard into a tool which can be ridden on more technical terrain. Overall, the design is well-conceived and effective but I would like to see the board better catch the right position on these clips while trying to align the deck for reassembly. 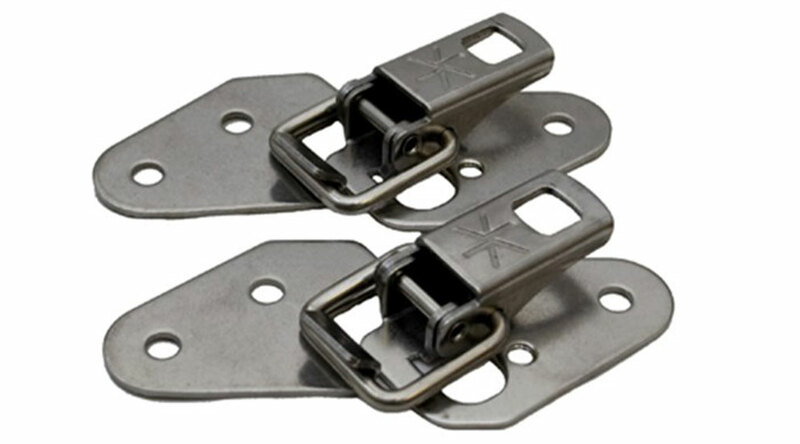 The Voile clips make it easier to slide the two halves into place than the Karakoram clips do. After riding with a friend this early season who had a positive review about the Karakoram splitboard clips, I decided to purchase a pair for my Venture Storm splitboard. My friend touted the Karakoram clips as making a significant difference in the (downhill) handling and response of the splitboard, so I figured I would give them a try. Although I enjoy splitboarding immensely, I have always been less-than-thrilled with the downhill performance that the Voile connector clips have provided. While the Voile clips fulfill the job of keeping the two board halves from separating, they’re somewhat lackluster in providing an adequate compressive tension between the two halves which, ultimately, dictates the general handling of the board. Luckily, the Karakoram clips provide this missing tensile connection. 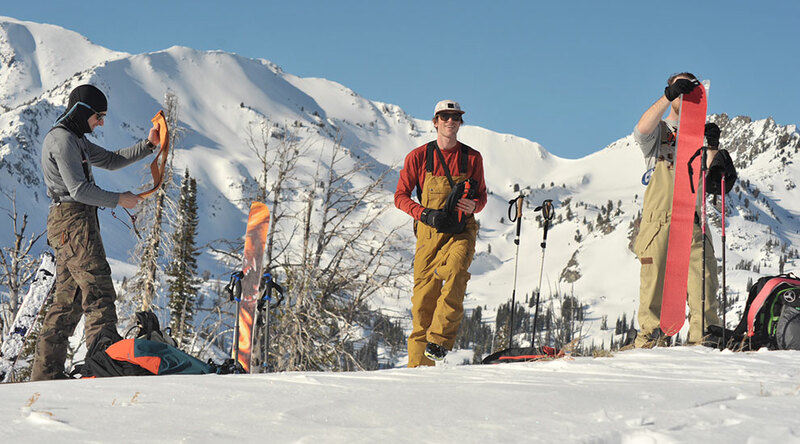 As a result of this enhanced tension, any minuscule, vertical defections (the infamous splitboard “chatter”) between the two board halves are nearly eliminated while riding downhill. Additionally, the clips provided enough tension so that the two board halves can interact together with a unified torsion, which acts parallel to the long axis of the board. Although this might seem insignificant, the latter greatly affects side-slipping, carving, initiating turns with your foot, among other handling intricacies. Armed with some Christmas revenue, I went online and ordered the splitboard clip kit from Karakoram and the associated hardware (sold separately). A couple of days later, the Karakoram clips had arrived in the mail. Installing the Karakoram clips on my splitboard was a breeze; I completed the installation in about 20 minutes. You simply remove the old connector hooks and associated hardware, and then insert the new Karakoram hardware into the pre-existing inserts in the splitboard. Bolt the Karakoram clips to the hardware, and then set the desired tension by adjusting the ‘hook’ component of the clip kit. The day following the installation, a front out of the northwest from Canada deposited over a foot of new snow in Hyalite Canyon. I was out the door early that morning and soon found myself at the top of a glade run, which is my preferred riding spot for storm days. I locked the newly upgraded board together and began my descent. From the moment I dropped in, I immediately felt a difference in the board, under-foot. The new clips made the Storm splitboard snappy, responsive with additional pop (that I hadn’t realized existed, previously). Upon exiting the glade area and merging back onto the well-travelled ski trail, I was impressed with how board handled the sharp turns and the abundance of snow swales. At times on the previous connector clip setup, I had instances where I felt like the board was controlling the rider, which is rarely a desirable feeling. With the Karakoram clips– even on the semi-technical, fast, swooping exit trail, I felt in total control of the board, which is something that I had only experienced in deep powder on that setup, previously. After approaching the trailhead, I thought to myself that these powder turns were some of the best yet that I had experienced on my splitboard. Granted, over a foot of new powder wouldn’t suppress these feelings of glee in any rider, but I was also really stoked with how the board performed with the new hardware. Grinning ear-to-ear, I was really impressed with how the new clips transformed my board into a more capable backcountry tool.